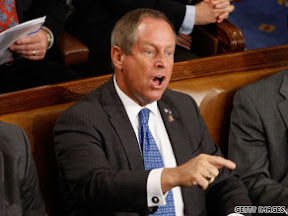 On September 9, 2009, Republican Congressman Joe Wilson shouted "you lie!" at President Barack Obama during the President's State of the Union address to Congress. The outburst came from Wilson after President Obama said his health care plan would not subsidize coverage for illegal immigrants. On September 26, 2011, The Los Angeles Times reported on the trial of the "Irvine 11" for disrupting a speech by Israeli Ambassador Michael Oren at the University of California, Irvine. The students expressed support for the Palestinian cause, and shouted phrases such as "You sir, are an accomplice to genocide," at Oren during the event. When Congressman Wilson called President Obama a liar, no action was taken against him for disrupting the President's speech. However, when 11 Muslim students called Ambassador Oren an accomplice to genocide, it was deemed an offence to be prosecuted in court. Since when has heckling become a crime? 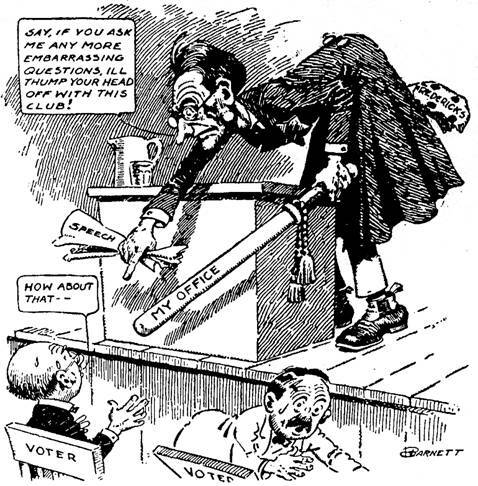 Those who speak or perform in public can expect hecklers, particularly with audiences who may be offended by what the speaker says or represents. 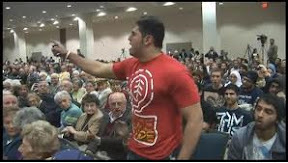 A student disrupting a speech by Israeli Ambassador Michael Oren at the University of California, Irvine. When Congressman Wilson called out "You lie", he believed that Obama was not telling the truth when the President said the legislation would not mandate coverage for undocumented immigrants. In Oren's case, representing a country with a record of brutal occupation of Palestine and never-ending brainwashing of the American public, the ambassador should have expected some heckling. That the Irvine University administration castigated the hecklers revealed just how brainwashed even academics in America have become. To them, Israel could do no wrong! Instead of supporting prosecution of the Irvine 11, Oren should at least have been expected to learn how to deal with hecklers. A clever speaker might have said, "I'm paid to act like a fool, what's your excuse?" If he got a second heckling, he could have retorted with, "You could play a human being with a little rehearsing." Every public speaker--especially those facing hostile audiences--should learn how to deal with hecklers. Instead, the case of the "Irvine 11" generated a national debate regarding free speech. On September 23rd, a jury found ten students guilty of two misdemeanours, conspiring to and then disrupting Oren's speech given on Feb. 8th, 2010. In the end, ten students were sentenced to 56 hours of community service and three years' informal probation. The Assistant District Attorney argued that Oren was "shut down", and described the students as "censors" who utilized the "heckler's veto". On the other hand, defence attorneys claimed that the students acted within the law and were exercising their right to free speech. Nora Barrows-Friedman, writing for Al Jazeera, argued that the Israeli Ambassador was "attempting to hoodwink college students into believing that Israel was a democracy." She added, "There is no democracy under Israeli rule for Palestinians: Those who live within the 1948 borders are subject to an apartheid system, while Palestinians in the West Bank, Gaza Strip and East Jerusalem are under the most brutal military and economic occupation of our time." Apart from showing films of a few children throwing stones at American tanks in the West Bank, the occasional heckling is all that's available to most Palestinians in America to fight the Israeli occupation and its apologists.